This paper seeks to problematize the role of local food systems within the food sovereignty movement and as a counter to the logic of the global industrial food system. It answers the question of how food sovereignty, via its tenet of local food systems, addresses the geographical and sectoral distances in the global food system. In doing this, it utilizes an approach loosely based on Chayanovian thinking and analytical tools provided through food regime analysis, the theory of uneven geographical development and the metabolic rift. The paper explores six forms of distance in the industrial food system – production from consumption, distant markets, peasants from their land, producers from consumers, the rural-urban divide and agriculture from nature. Then the paper situates local food systems within food sovereignty and food sovereignty within the wider transnational agrarian movements from which it emerged. Next the paper differentiates local food systems by scale, method and character. 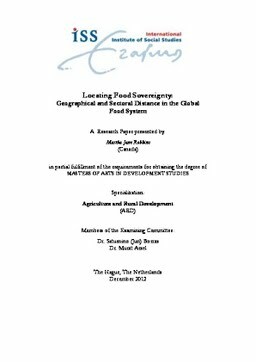 Finally, it illustrates how and to what extent food sovereignty counters these distances by evaluating the abilities and gaps of food sovereignty in relation to the various forms of distance.